Kindness goes a long way and can change your world! This day . . . Think Kindness . . . Be Kindness. If you haven’t already noticed, there is more than enough angry rhetoric and actions in the world. 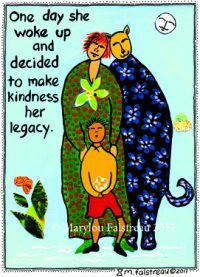 Play a part in balancing this out by making your legacy one of Kindness. My kindness today is to thank you for posting such meaningful and thought provoking posts.